You know the old saying, “If you look long enough, you’re bound to find what you’re looking for”? Well that’s not really an old saying. In fact I just made it up right here. It’s that sayings debut. Take it. Let it loose out into the world and tell everyone you saw it here first. What I’m babbling about is something I’ve come to find out in my nearly 41 years on this big blue rock we call home, and that’s when you think you’ve seen and heard all the great stuff something will always appear from out the ether to further blow your mind. For me, I’m always looking for some great new artist to light my fuse, butter my bread, and/or rock my socks off. Just when I think everything is stale and same-y, along comes a band or artist that grabs me by the lapels and shakes me until my retinas are detached. Oneohtrix Point Never is that artist as of late. So I was familiar with Daniel Lopatin, aka OPN(that’s Oneohtrix Point Never just abbreviated. Why? Because I’m lazy.) I’d heard last year’s R Plus Seven and liked it. There were many references to John Carpenter and “spooky music”. While I did find some of the album “spooky”, I found it harder to hear those Carpenter references. So I jumped back to the album before that, Replica, and was still kind of on the fence. I don’t think I was quite ready for Lopatin’s synth landscapes and analog narration. Well fast forward to three weeks ago and on a whim I played R Plus Seven again and something clicked. It was dark and eerie as I’d remembered from last year; but there was also a depth to the album I hadn’t noticed before. I immediately jumped back to Replica and was floored once again. I think a lot of my newfound love for Oneohtrix Point Never stemmed from my recent analog synth binging with the likes of Jakob Skott, Bernard Szajner, Rudiger Lorenz, and Sinoia Caves(aka Jeremy Schmidt.) These artists completely opened my mind to what can be done with a stack of Moogs, Juno Synths, and TR-808s. Lopatin’s most recent albums resemble haunted houses created with vacuum tubes and square waves. Buzzing swaths of tension and dread. Ghosts swoon amidst the static and synthesizer stabs. Replica and R Plus Seven show a drastic shift in Lopatin’s musical communication. Once I jumped back to his first few self-released albums he had definitely begun in a more ambient, textural landscape. Betrayed In The Octagon is definitely more Tangerine Dream than John Carpenter. It’s more soundscapes and set adrift than haunted and tense. Drawn and Quartered, Russian Mind, and The Fall Into Time all keep that vibe going as well. 2010s Returnal shows a shift in composition, though. It feels more in-your-face, harsher, and a definite shift to what he did on Replica and R Plus Seven. I am quite fond of both musical sides of Daniel Lopatin. Being a huge fan of Tangerine Dream I’m drawn to his earlier work. I find myself putting on the earlier albums quite a bit lately. They are conducive to a glass of stout and deep reflection on the couch. “Behind The Band” and “Parallel Minds” on Betrayed In The Octagon are two favorites, while “Woe Is The Transgression I” is an epic opener that brings to mind Vangelis’ work in Blade Runner. Vangelis does pop up now and again on the earlier albums as an artist that comes to mind in sound. 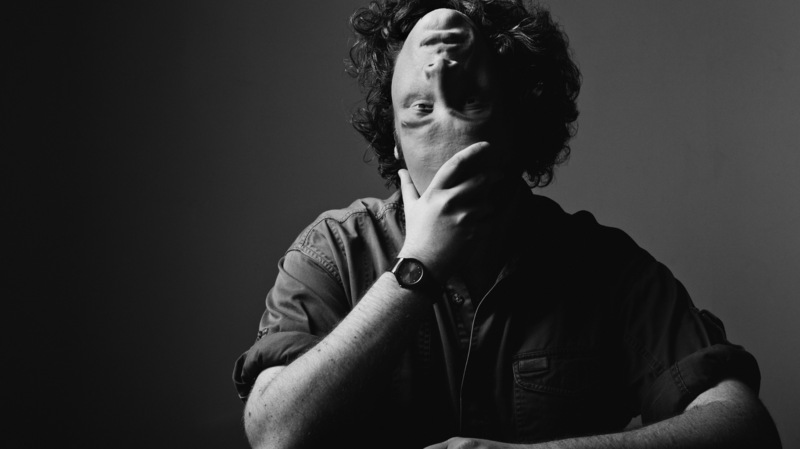 But Lopatin dabbles in musical corners more darkly lit. His musical world is filled with many shady alleys and coarser, blacker skies. Another thing that impressed me is that his earlier stuff was all self-released. A guy toiling in an apartment making these synth collages for the love of the music. It reminded me of another synth loner, Rudiger Lorenz. His masterpiece Invisible Voices was recently reissued thanks to Mexican Summer and Kemado Records(Kemado has been reissuing Lopatin’s earlier albums as well.) Rudiger was a German pharmacist by day and by night he made these albums filled with synth collages in his home studio. I think it’s great he’s finally getting some recognition for his great work. I’ve gone on long enough. If any of these words I said above this line meant anything to you, then give Oneohtrix Point Never a listen. For those fans of Tangerine Dream, Carpenter scores, and those other cats I mentioned.